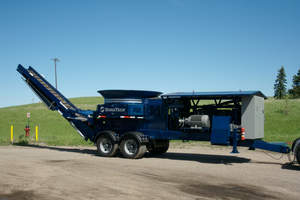 JAMESTOWN, ND--(Marketwire - August 17, 2010) - DuraTech Industries announced a new addition to the grinder lineup, the 2009 Electric Tub Grinder. The 2009 Electric Tub Grinder is a stationary machine (skid or moveable) with electric motor drives that produces ground product at the same rate as its diesel counterparts. DuraTech's 2009 Electric Tub Grinder has a 400 hp soft start main drive motor and a 75 hp motor to power the hydraulic system. Both motors are available in various voltages to fit power grid specifications. The electric motors provide steady power with no emissions, low noise levels and little required maintenance. "We wanted a strong addition to the 2009 Tub Grinder lineup," said Al Goehring of DuraTech Industries. "The 2009 Electric Tub Grinder has all the same quality features of the other 2009 Tub Grinders with less noise and emissions along with lower operating costs." The 2009 Electric has a heavy duty hammermill for heavy duty jobs and tilting tub with easy access for service and maintenance. A PT Tech torque limiter protects the motor and hammermill from overloads, jams and costly repairs. The unit has governor controlled tub speeds and a hydraulic folding stacking conveyor. The stationary machines are available as either a skid unit or a moveable unit with a pintle hitch. The 2009 Electric Tub Grinder joins the 2009 Industrial Tub Grinder and 2009 Track Industrial Tub Grinder. The 2009 Tub Grinders are efficient production grinders. They come standard with a 40 inch rotor, stacking conveyor with a wide-belly belt, PT Tech HPTO 12 clutch and other amenities. About DuraTech Industries International, Inc. Established in 1966, DuraTech Industries International, Inc. produces durable DuraTech industrial grinders and Haybuster agricultural equipment. Headquartered in Jamestown, N.D., USA, DuraTech manufactures more than 26 agricultural and industrial products, which are marketed worldwide through a network of 600 dealers. For more information, visit www.duratechindustries.net.